Obituary for Catherine (Lydon) Bachelder | Edwards Memorial Funeral Home, Inc.
Mrs. Catherine (Lydon) Bachelder, 97, of Milford MA, died early Wednesday morning (December 5, 2018) at UMASS Memorial Medical Center in Worcester MA after an illness. 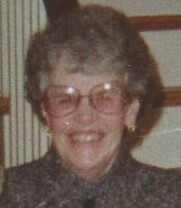 She was the beloved wife of the late Joseph L. Bachelder, who died in 1992. Catherine was born in Maamgovner, Ireland the daughter of the late Patrick and the late Bridget (Joyce) Lydon. She attended public schools in Ireland as a young girl. Catherine came to the United States with her family in 1948. She had been a resident of Milford MA since 1968 and prior to that had resided in Lynn MA. She had been employed at Jt. Joseph Rectory in Lynn MA for a number of years. She was a communicant of St. Mary of the Assumption Church in Milford MA. Catherine is survived by 1 Brother: Martin Lydon of Wales; 1Sister: Annie Horan of Ireland; 1 Step-Daughter: Janice, wife of Richard Manion of Cambridge MA; 1 Granddaughter: Jennifer Manion of Cambridge MA; also numerous nieces & nephews. Her funeral will be held Tuesday (December 11th) from the Edwards Memorial Funeral Home, 44 Congress Street, Milford MA followed by a Mass of Christian Burial at 10am in St. Mary of the Assumption Church, 19 Winter Street, Milford MA. Burial will follow in New Calvary Cemetery in Boston MA. A visiting hour will be held Tuesday morning (December 11th) from 8:30am to 9:30am, prior to her funeral Mass.